Since the debut of our new website, Array has had the ability to showcase the great work we’ve produced for some amazing clients. This month, we wanted to take some time to feature one project we’re particularly proud of – the Yonanas website. 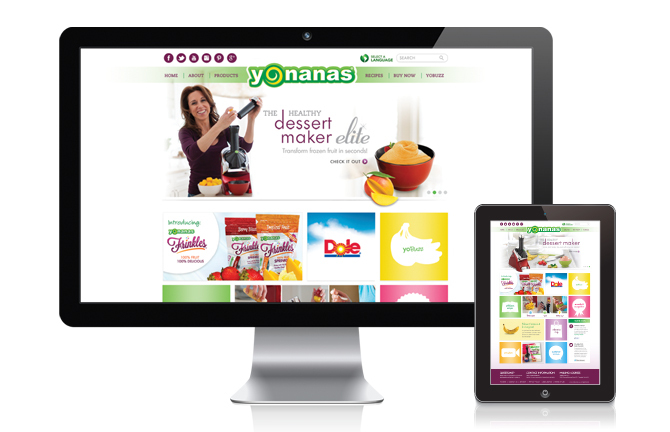 Yonanas, a Healthy Foods LLC brand, recently launched their new, refreshed website. Yonanas is a healthy, silky-smooth, delicious alternative to ice cream, made from only 100% frozen fruit, that anyone can make and enjoy in minutes. Array Creative has been involved in every aspect of the Yonanas brand, from branding to packaging and merchandising. So we are very excited to have developed together a web presence that reflects their fresh, innovative personality and healthy lifestyle. The new site showcases their great products, nutritious recipes and helpful insights that foster good health and well-being. Visit yonanas.com to learn more, or find your nearest retailer to purchase a Yonanas Healthy Dessert Maker.